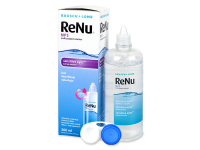 ReNu MPS Sensitive Eyes is a multi-purpose solution in a 360ml bottle. 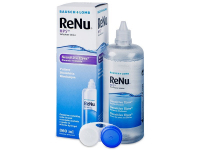 It is designed to clean, rinse, disinfect, remove protein deposits, and store your soft contact lenses. Manufactured by Bausch and Lomb. ReNu MPS Sensitive Eyes is a new, multi-purpose solution from Bausch and Lomb available in a 360 ml bottle. It has been specifically formulated to clean and remove protein deposits from lenses and is ideal for contact lens wearers with sensitive eyes. Each package contains an antibacterial lens case for maximum cleaning power. Read more about ReNu MPS Sensitive Eyes solution.